Growing up we had a huge cherry tree in our back yard. It was so big and pretty. I especially loved the pink flowers when it bloomed every spring. I would grab cherries off the tree an enjoy them all summer long. I remember when I became a teenager my mom helped me cut off a branch from our cherry tree. It was so nice and such a pretty color of wood. I would hang and dry the flowers I received from dates and school dances. 20 years (or more) later and I still have that cherry branch. I can’t remember what happened to the flowers but I still have my branch from that cherry tree. My parents no longer own that home so I keep it as a reminder of fun summers full of eating cherries. Cherries always bring back these memories for me. When I received a variety of cherry products from Cherry Man to try out I had no clue how much it would make me think about my childhood. One of my other favorite things are pastries (as you probably know from the many pastry recipes on this site). So I knew I would be making a Cherry Cream Cheese Pastry to share with all of you. It is very similar to my Blueberry Cream Cheese Pastries – just change a few ingredients out for different flavors. 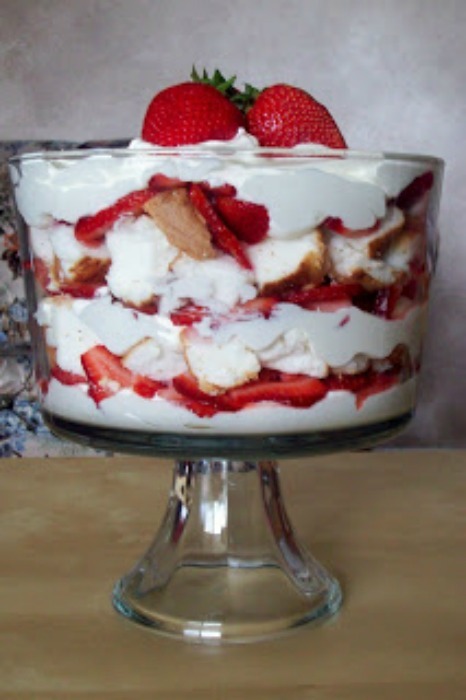 You could do this with all different kinds of cream cheeses and fruit. Thaw and cut your puff pastry to make several squares and in no time you have a delicious pastry to serve for dessert or to enjoy for breakfast. 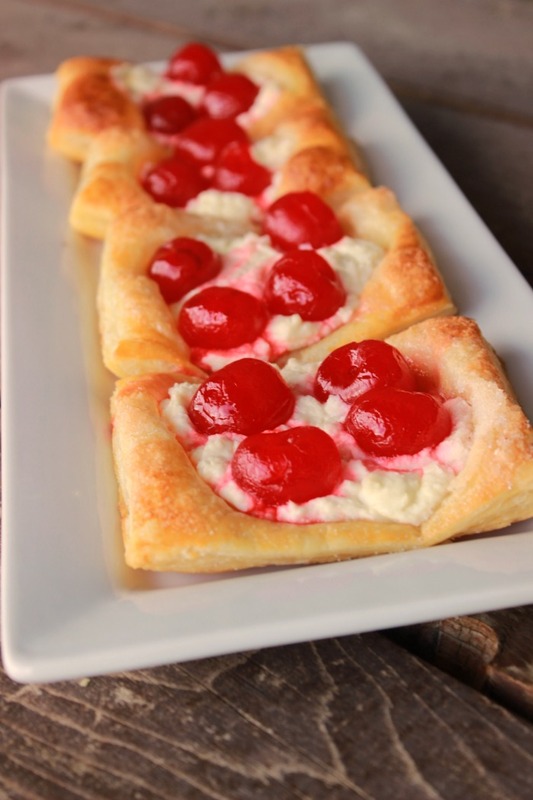 These delicious pastries have a yummy layer of cream cheese, delicious cherries and topped with a sweet glaze. Yum! I received all of the these fun Cherry Man products to try out. 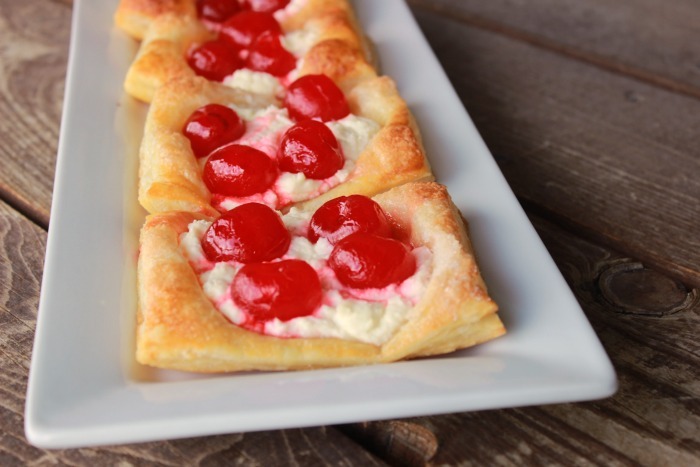 I used the Jumbo Cherries for this recipe. Add your cream cheese, some cherries and sprinkle with sugar. Thaw your pastry according to package directions. Preheat the oven to 400 degrees. Cut each pastry evenly into thirds horizontally and into thirds vertically so you have 9 squares per pastry sheet. Place the pastry squares on a parchment lined baking sheet. Mix together the egg and water to make an egg wash. Brush each pastry square with the egg wash.
At the center of each square spread a tablespoon of cream cheese. 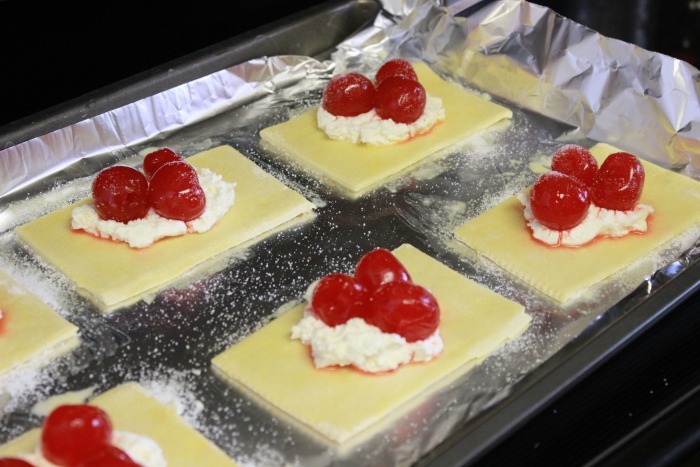 Add 2 or 3 cherries to the cream cheese and then sprinkle sugar over the pastry squares. Bake in the oven for 15 minutes or until golden brown. While pastries are baking make your glaze my mixing the powdered sugar, vanilla and milk together. 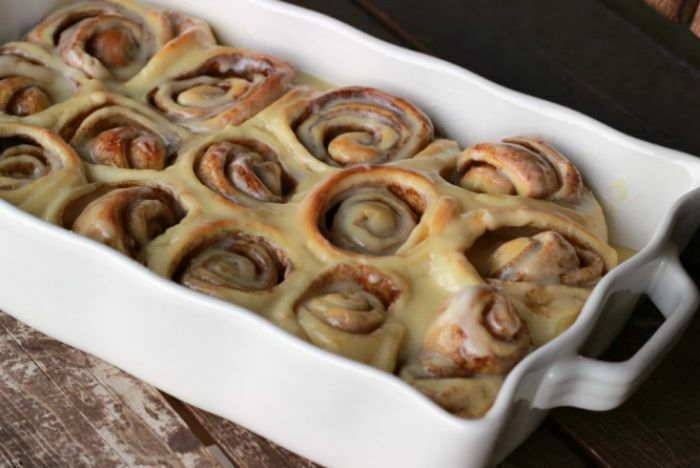 Once the pastries are out of the oven let them cool for a few minutes then drizzle on your glaze. You can serve nice and hot or at room temperature. Want more? 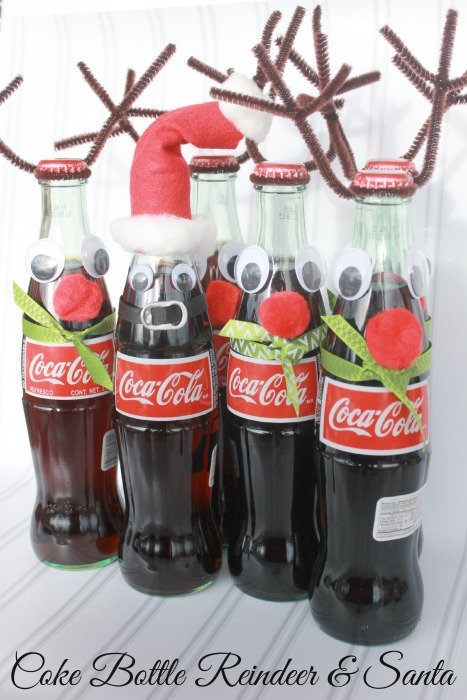 Sign up for the Food Crafts and Family Newsletter and receive recipe and craft ideas delivered to your inbox! 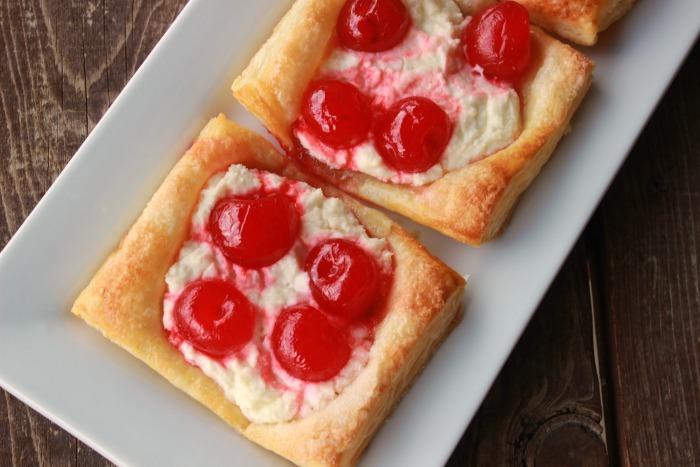 If you really like my Cherry Cream Cheese Pastry recipe, you will also love the following recipes. I have pulled them together for you right here! 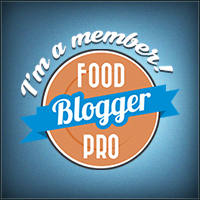 If you are looking for more desserts check out my Yummy Treats!